Our very own Assistant Director, Dr. Sam Gellens, led a talk focusing on some of the Great War’s most iconic images as part of our series of conversations on World War I. He discussed how these works of art were used for a variety of purposes: in the service of propaganda, as expressions of grief, and as a bitter commentary on civilization in the wake of the war. Dr. Gellens opened with the 1914 poem by Rupert Brooke titled “The Soldier,” which was written at the beginning of the war and celebrated death in combat as an expression of English patriotism and nationalism. He then delved into the images of the time in depth, for example, how the U.S. government commissioned various artists to create wartime propaganda posters. 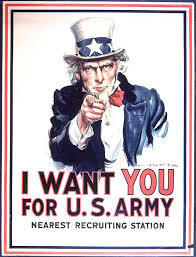 Perhaps the best known of these remains James Montgomery Flagg’s famous “I Want YOU for the U.S. Army” recruitment poster, featuring Uncle Sam (Flagg used his own face as the model). Aside from propaganda, art was used to express grief over the losses sustained during the war. The most prominent example of this was Kathe Kollwitz’s sculptures, “Grieving Parents.” After losing her youngest son, Peter, earkly in the war, Kollwitz searched for an appropriate way to express her grief, resulting in these sculptures of a grieving mother and father, which were installed in a German military cemetery in Belgium. In contrast to this highly personal use of art, artists such as Otto Dix and George Grosz depicted the general horrors of war and its effects on humanity. Dr. Gellens pointed out that their angry, bitter representations of war have a phantasmagorical, otherworldly quality, implying that civilization has died as the result of the ferocity of the new and highly destructive weapons employed such as poison gas. The horror of this is depicted in a particularly striking manner in Dix’s “Stormtroopers Advancing Under Gas,” which graphically portrays soldiers wearing gas masks that seem to strip away their humanity and make them look like aliens. 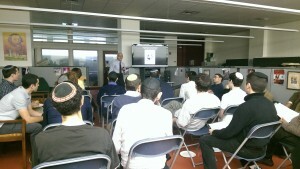 The presentation provided a unique and highly interesting perspective on World War I and its horrors from the angle of both art and literature.